Why it is time to rethink our views on Henry Norris, the man who made Arsenalal? Henry Norris has always suffered a bad press in football terms. He has come down to us as an arrogant man, a bully, self-opinionated, and above all a man who was shamed out of football, having been found guilty of having his hand in the Arsenal money box. And yet, the more I read about the man, the more I dig around, the more I am in awe of him. Not my type of person at all, and when I started to work on the life of Henry Norris for “Making the Arsenal” I was inclined to accept the general view. Paid for the building of Highbury. He didn’t own the land – he leased it, and had to give personal guarantees that the rent would be paid. He took on a lease that said that at the end of the lease he would have to return the land to the original owners in the condition he took it over in!!! But he took the risk for Arsenal. He, and he alone, took over Woolwich Arsenal FC when it was dead in the water. Without him in 1910 there would now be no Arsenal. Instead there would be Woolwich FC – the little club that took over the Manor Ground when Arsenal left in 1913. He took us into the First Division, and set the scene so that we could stay there forever. Of course Tottenham have vilified Arsenal and Norris for this, but as has been shown on this site and will be shown in the next AISA Arsenal History booklet, the Tottenham view of events is far from the truth. If Norris and Arsenal did anything wrong at this time it was to back off from the issue of the match fixing that had been endemic in the game in the final pre-war season. He gave us Herbert Chapman. Of course Norris could have been a horrible nasty man and still done all these things, but I wonder if this really is the right interpretation. As I come to write up the history of Arsenal from 1910 to 1919 for the next AISA Arsenal History Society publication, I find myself thinking: where is all the evidence for Norris’ bad behaviour? Compared to politicians today (and this was Norris job – he was Mayor of Fulham, and an MP for the area) he doesn’t come out too badly. His columns in the press on football matters were forthright and many people didn’t like them – but that does not make him intolerable. In many regards he was the scene setter for Arsenal’s financial stance today. He said he wanted Woolwich Arsenal to break even, and that if it could not he would move it somewhere else. This is what he did. Perhaps most of all I am influenced in my wish to re-think Norris by the fact that Jack Humble resigned from Woolwich Arsenal’s board in 1907 (before Norris) and came back at the invitation of Norris in 1910. Humble was no fool, and was himself a man of honour, from an utterly different background from Norris. And yet Humble and Norris worked together from 1910 until the late 1920s. How could that be if Norris was so awful? Yes we have a couple of quotes from people saying how terrible Norris was, and we have the fact that he did break the rules – something that led to his banning from football. But neither of these things should give him the reputation that he has – especially in the light of all that he has achieved. It is time for a rethink, I feel. 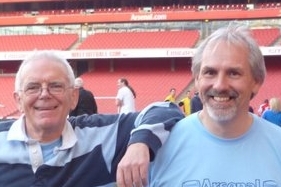 1 comment to Why it is time to rethink our views on Henry Norris, the man who made Arsenalal? Whenever I read someone trying to change a man’s historical reputation with a book or newspaper column, I get skeptical. Yet Norris sounds like he was no Walter O’Malley, or even a Bob Irsay, two men who did things that make the people who moved the old Wimbledon to Milton Keynes look tame by comparison. Maybe he was bipolar — or simply had what we would now call mood swings. Or maybe it was a cold calculation, figuring out who he could be accomodating to and who he could let himself by nasty to.